It's only a little over twelve months since I last saw a-ha. I've always had a soft-spot for them, and "Scoundrel Days" was one of the very first albums I ever owned. Even so, I wasn't really expecting all that much from the 2009 version. They were amazing: without a doubt one of the best gigs I've seen in years. At that point, the band had already announced that they would be splitting up in 2010, so when we saw that there would be a Nottingham date on their farewell tour, it seemed something of a no-brainer. OBVIOUSLY we'd be going to see them again. One year down the line, and if anything my appreciation of the band has grown. After enjoying the NIA gig so much, I found myself listening to their greatest hits album more and more, and, having long since lost my original cassette, I was lucky enough to be given a copy of the "Scoundrel Days" CD for Christmas by a very thoughtful little miss LB. It's a fantastic sounding album, even today. No question: I was very much looking forward to seeing the band live again and hearing those amazing songs performed live by the band one last time. Tickets were expensive -- double what I've paid to go and see Elbow in the same venue in March -- and perhaps as a result, the arena was not full and there were reasonably large swathes of empty seats. In contrast, the NIA last year, one of only three UK dates the band played in 2009, was absolutely packed on the back of a top 5 album, "The Foot of the Mountain". Perhaps it's too soon for them to be touring again? No, surely that can't be it... not when it's a farewell tour? Still, the fans that were there -- and it was still a decent crowd -- were clearly well up for it: the lights dimmed and it was immediately clear that there were a lot of very excited women in the crowd. Unfortunately for my eardrums, one of the most excited appeared to be sitting directly behind me. When she wasn't shrieking at high volume, she was whistling right into my ear. I bet she bought one of the £15 hardback souvenir programmes..... and good luck to her. I've seen worse value for less at Arena gigs in the past, after all. The tour was called "Ending on a High Note", and the merchandise was extensive enough to allow fans to buy one last souvenir to remind them of the band, without being overwhelming: no shower-curtains and coasters, but you could purchase mugs, iPhone covers, some delightful tasseled winter woolly hats, mugs and a decent selection of t-shirts. 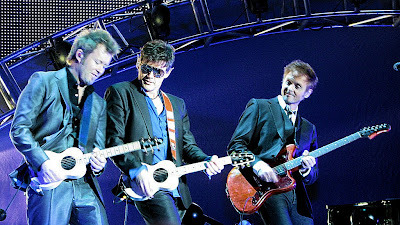 To be fair, a-ha are one band it's definitely worth screaming at: for guys in their early 50s, the band look amazing. They've weathered astonishingly well over the years. If Take That look like this in 10 years time, they'll be doing alright. Harkett has always been a fantastic looking guy, of course, and with those cheekbones, it's hard to go too far wrong, but the other two actually look better now than they did in the 1980s. They take to the stage, wave at the crowd and launch straight into "The Sun Always Shines on TV". It's a great song, but now I'm worrying that they're going to play exactly the same set as I heard at the NIA a year ago. Well, many of the backings on the big screens are the same, but as they accompany specific songs, that's hardly surprising. In fact, I'd be amazed if the setlist to the average a-ha gig has varied by much more than 25% since 1989, simply because there are lots of songs that they simply HAVE to play - many from their first two albums. With that in mind, I think they actually do a really good job of mixing things up, with a little acoustic interval and a few of their less obvious songs. "At one point the huge screen behind the band shows footage of a rising swell in the ocean, and for me this is how a-ha sound: they're widescreen and windswept and Harket's voice is sometimes as pure and lonely as a gull calling across an expanse of ocean; they're open and desolate like tundra..... they're utterly defined by their success in the 80s, but even their oldest and most famous songs do not sound in the least bit dated". My one criticism, and the reason I didn't enjoy this gig as much as the last time I saw the band, is that it's all a little bit bloodless. The fans are well up for the gig, of course, but they seem to be rather more upset about the forthcoming breakup of the band than the band do themselves. Harkett has never been particularly forthcoming with his audience, and he seems to spend most of his time fretting with the sound guy about his right ear-piece, or hiding behind a huge pair of sunglasses and not engaging with his fans. "I love you Morten!" one fan screams, pausing before optimistically adding, "Do you love me?". Paul barely speaks, and so it is left up to Mags to do all the talking, which basically consists of thanking the fans for 25 amazing years. Fair enough, but although they're very good, this lack of emotion stops this from being an amazing gig. Then again, perhaps it's hard to criticise the band for being the embodiment of their cold, clear sound. They're an excellent band, and sounding as good today as they probably ever have (2009's "The Foot of the Mountain" sounds great and easily stands comparison with their biggest hits from the 80s). How many other bands who have been around this long can say as much? Certainly not the Rolling Stones. They finish with "Take on Me", of course.... ending their last ever gig in Nottingham, and one of their last gigs ever, quite literally, on a high note. The shrieking girl behind me is in tears. A good show by a fantastic, legendary band. Before you go, be sure to read LB's review of the gig in the Evening Post, where some bright spark of a sub-editor has tried to get him into trouble by pulling out this quote as the headline of a very fair and balanced review: "Morten Harket is one of the least charismatic front men in pop".